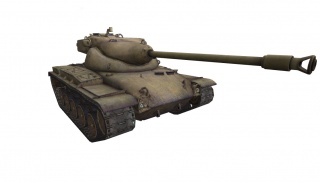 The T69 is an American tier 8 medium tank. 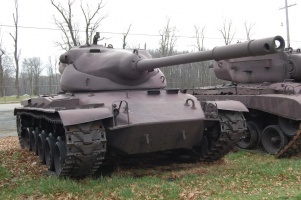 A prototype with an oscillating turret and an automatic loading system developed at the beginning of 1955 and based on the T42 experimental medium tank. The vehicle underwent trials from June 1955 through April 1956. The vehicle never entered mass production or saw service. 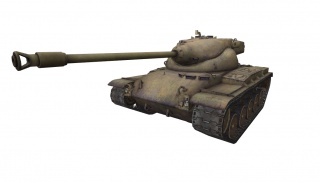 The T69 medium tank is similar to the French AMX 13 90. 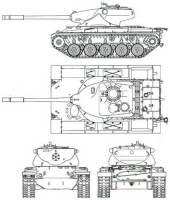 Although it is a bit slower, it has more armor and more concentrated firepower. 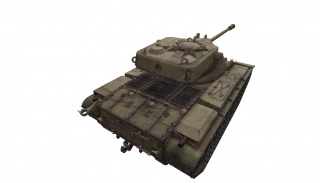 This increases the chances of players bouncing rounds off of it, allowing some players to take on tier 9 mediums in this tank. However, the top gun only holds 4 rounds in a magazine, meaning you have to pick your fights. The T69 leads to the T54E1. Worst AP penetration for medium tanks in its tier; HEAT is rather ineffective. Extremely weak protection on modules and crew; constant ammo rack damage. 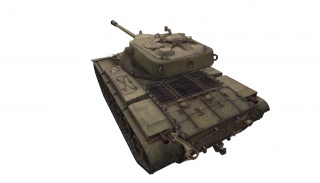 Armor generally unreliable, sides and lower glacis are made out of ammo racks. Horrible aim time, coupled with bad accuracy. Play from the rear, always in support, always from the rear (even when the team is winning) and always with support. Use your excellent view range to your advantage. As mentioned above, the autoloader reloads quite quickly between rounds - about 2 seconds - so with a full magazine you can fire repetitiously. The magazine holds 5 rounds on the 76mm, but only 4 rounds on the 90mm. The 76mm's magazine will reload in roughly 15 seconds - depending on your crew skills, equipment, and consumables, of course. The 90mm takes longer to reload - naturally - at around 26 seconds. To a player wanting a change of pace, one can try the 76mm gun even if they already have the 90mm gun. With the perk Dead Eye and the fact you're shooting more shells you will find engines and modules will constantly feel the pain, and scouts be much easier to dispatch. Naturally, Vertical Stabilizer and Gun Laying drive are even more effective in this scenario. This page was last modified on 7 August 2018, at 08:49. This page has been accessed 350,448 times.